Sometimes I think Singaporean loves to hype up certain reputations of various restaurants serving their signature dishes. Tales of long lines of customers waiting to be serve is one of the most popular ones. Sometimes I think is just like an urban legend. It makes a normal story more sensational and in this context, the dining experience more interesting. You get tell your office buddies the next day about how you managed to get a seat and ate the “legendary” dishes just to make them envy. 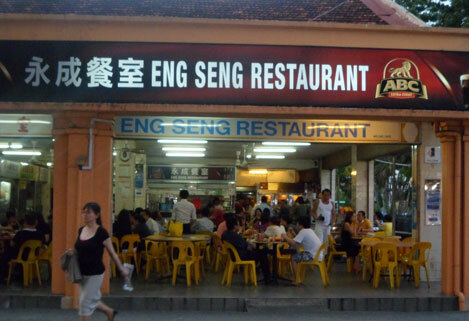 Eng Seng Restaurant has it own tale when it comes to long cue of customers waiting to order their famous black pepper crab dish. I have been told that people start lining up as early as 4pm just to order the famous Singapore crab dish. By 7pm it will be completely sold out. Finally a friend who is a captain with Singapore Airlines invited me to go have dinner in Eng Seng Restaurant. Over the phone, he cautioned me not to be late when he comes pick me up. He too, I guess have heard about the long cue tales of this restaurant. We arrived at 6.30pm and he asked me to get down from his car and go order the food while he goes look for parking. As I got down from his car, I do not see long cues. I however do like the look of the restaurant and I quickly snap a picture of the restaurant entrance. Restaurant without air conditioning and plastic chair is a good sign of a good place to dine. I can imagine my friend being mad if someone ordered the last black pepper crab because I took few seconds to took the picture of the restaurant. There were still quite a few tables available and I was glad when the waitress told me that the black pepper crab is available. I ordered black pepper crab, mee goreng ( fried noodles with sea food ) and a vegetable dish sauteed with garlic. The service is pretty fast as within minutes our food arrived. The black pepper crab tasted pretty good. 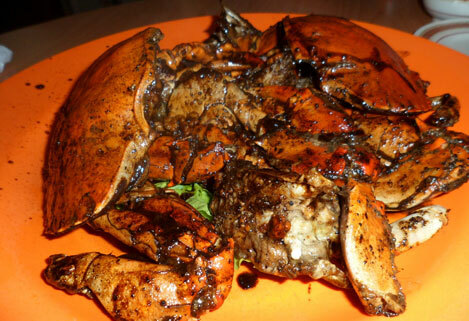 It does not taste like the usual black pepper crab as it is not too spicy and it has some sweet flavor in it. My taste buds tells me that they might be adding some marmite into it. The crab is kinda small compared to some crab that I have eaten before. I also have no clue if it is Sri Lankan crab or other type of species. 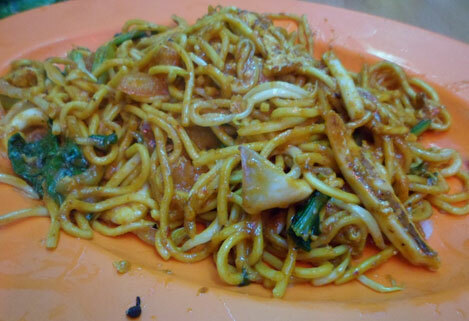 The mee goreng is not spicy and tasted a little bit sweet too. I prefer my mee goreng spicy and my favorite versions are the ones cooked by Mamaks from Malaysia. I guess this is the Chinese version of mee goreng. Can’t beat the Mamak’s version as they are the inventor of this noodle dish. The vegetable dish is good. 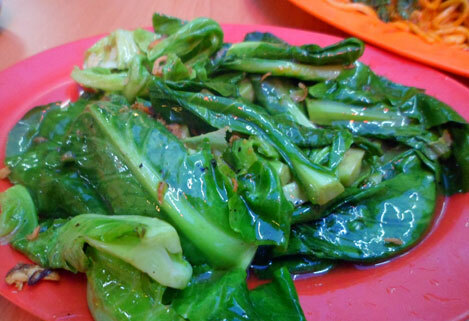 Kailan ( not sure what it is called in English ) sauteed with garlic. The kailan is still crunchy and didn’t taste over or under cook. The amount of soy sauce, oyster sauce and garlic used are just right. I was pretty happy with the meal, especially when they is no long que and the black pepper crab was still available despite we arrived at 6.30pm. I wanted to ask the lady boss whether the stories about long ques and have to phone early to book your seat were true. When she came to give us her bill, I just decided not to ask as she could tell me anything. I do know that they close by 8pm though. I am not sure if I got lucky or what on that day, but some how I got the feeling that the stories were hyped rather than it is the norm. So to those of you who were intimidated with the stories of long cues but dying to taste the black pepper crab, now is the time to go. But I think somewhere around beginning of this year it was rumoured that it had moved to somewhere else and slowly the crowd is gone..